Whether it’s about physical motion or rallying for a cause, music has the ability to reflect or even inspire movement in our culture. 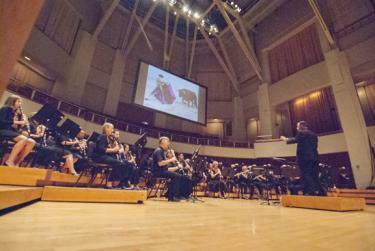 Join the Maryland Community Band as we explore a short selection of works linked through a common thread of movement. Get your dance shoes for some ballet with Rimsky-Korsakov and Arabesque dance moves with Hazo. Prefer bullfighting? Perhaps doing a pasodoble with Texidor is more your style. Or maybe you would rather march along with Fucik’s Italian Guard. Want to feel inspired? Then feel the power of Camphouse’s Movement for Rosa Parks who inspired legions to fight for their civil rights.